DO NOT PLACE ANY CONTENT HERE!!! 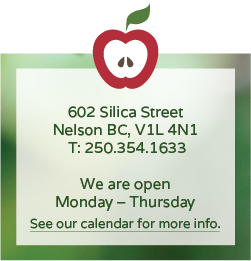 At the Nelson Food Cupboard, we believe having access to healthy food is a human right. Due to various social and economic factors, many people in our community do not have sufficient resources to provide food for themselves and their families. We are here to bridge that gap. The Nelson Food Cupboard is a barrier-free food bank; we allow people to come to our food bank as often as they need and we don’t ask them to justify why they need to use our services. We respect individuals’ rights to privacy and dignity and aim to create a welcoming and safe atmosphere for people of all backgrounds. Currently, we serve over 1,000 people every month and aim to meet their diverse family and dietary needs with healthy foods. Our Food Cupboard customers come from Nelson and the surrounding towns and rural areas. One quarter are children. Many of our customers struggle to make ends meet on social assistance, some work for low wages and support families, and others are in transitional periods of their lives.